The first, and simplest, method for forming 6BR Improved brass is to seat a bullet long into the lands, with strong neck tension, and then fire the case with a near full-power load. Make sure the bullet seats firmly in the lands so the case can't move with the firing pin strike. This works best with a .271" necked barrel dedicated to the fire-forming task, but reamed for the final "improved" case profile. "I've fireformed a lot of brass in a surrogate barrel by seating the bullets long and inserting each cartridge in the bolt, under the Sako style extractor. Some feel that you must expand the necks a bit and then size them down in a Dasher die to get the false shoulder. That is a good idea but I seem to get by without those steps." --Jay (JayIdaho), Benchrest.com. Another shooter told us: "I've talked to a lot of guys on this subject and you would recognize their names. 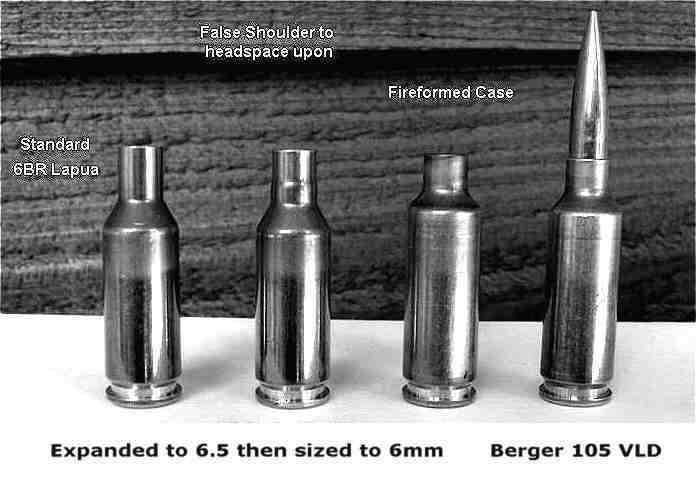 This is my distillation--most of them think it's OK to fireform by headspacing on the bullet when blowing out 6BR cases into 6 Dasher. But they usually have a separate barrel to do it with because you're just putting that many more rounds down the barrel...." Also, if you fireform with a dedicated no-turn chambered barrel, you don't have to neck-turn until AFTER the brass is fire-formed, and this is quite a bit less work, since you've shortened the neck by half. The second method of forming 6BR Improved brass involves a couple extra steps. First, you expand the neck with a .257 (or 6.5mm) expander mandrel. Next, you re-neck-size the case, but only about half-way down the neck. This creates a false shoulder transitioning from .243 to the larger caliber (see photo). That shoulder anchors the headspace during fire-forming. Here's how one shooter has achieved good results with Method 2: "Dasher brass seems to be best made from Lapua with a chamber neck of .271". Expand to .257 or .264 using a Lyman M-die or such (I use .257) and size the neck down to about .267 OD using an appropriately sized FL or neck sizer. I use a Redding 6BR S-die with a .267 bushing (same setup for routine resizing). Adjust the die height until the bolt just closes firmly on the neck bulge which acts like a shoulder to control headspace. Fire with a full-house 6BR load to form. So far, I've made at least 250 pieces of brass using the method outlined, lost maybe two in the process. None have had to be bumped despite at least a dozen reloads. All were shot in either a Rem. 700 or Viper action. The Dasher is a truely excellent, stable and efficient design, once the cases are fit to the chamber, none of their dimensions seem to change with subsequent firings!" --Don (ClarkFreese), Benchrest.com. Note, during the expansion stage, we recommend using a .257 round-nose neck-turner mandrel or a .257" elliptical expander from a Hornady sizing die. These work better than the Redding straight taper expander button or the K&M Expandirion. The expandiron is easy to adjust, but the mandrel has a sharp corner which bumps on entry and exit from the neck. "I like to create a false shoulder on the lower part of the case neck. This will help blow your brass out to the demensions you are looking for. I also jam the bullet into the lands about .010 for added insurance. With out a shoulder to head space on, I have had some of the rounds not go off. The primer was hit but the case moved ahead just far enough so the round did not go off. You are better off going with as hot a load as the rifle will allow without running into high preasure problems to be sure that the brass blows out as much as possible the first time. With light loads, you will notice a wide range of case lengths after the first firing. I seemed to have had a harder time getting the cases to blow out to a length I would be happy with. Even then some of the cases are still about .025 shorter then maximum allowable with the reamer that was used for my chamber demensions. I am using VV N-550 to blow out my cases, and some others use Varget with good results. I have several wildcats and this one needs a false shoulder and a bullet jammed to get best results."--D.J. of WI, Benchrest.com. The third method is a shortcut, but it works well if you will be fire-forming the cases in a tight-necked chamber. Basically you measure where the new shoulder should be, then you turn the virgin case neck just to that point. This creates a stepped neck that serves as the false shoulder. Respected gunsmith Mike Bryant explains: "Since you have a tight necked chamber, I'd turn the necks down the neck just enough to allow a loaded round to chamber. I'm not talking diameter wise, but the length of the turned portion down the neck. Say you would be turning about 1/2 of the neck or so whatever it takes to allow it to chamber. I'd turn for .010" thick necks and more or less make a mini false shoulder by where your neck turning stops. Then seat hard into the lands and fireform. This is what Bill Shehane told me that he does with his cartridge similar to the Dasher and I don't see any reason why it wouldn't work with the Dasher....Necking up to .257 caliber and then back down to create the fireforming shoulder is the best way and won't get you in any trouble and is the way that I always thought was the best way. It's about the same thing as making brass for a .22 Dasher as with the .22 Dasher you set the fireforming shoulder by necking down the 6 BR to .22. Neck turning part way down the neck is a get-by solution that can work." Note: Method 3 avoids the expansion step, but if you aren't careful the results may be disappointing. If you turn too far down the neck, the case won't headspace properly and it may be ruined. If you turn too little, the case won't chamber for fire-forming. We think Method 2 is generally best. It assures a nice, firmly headspaced cartridge, and (unlike method 3), it will work with the "no-turn" chambers that so many shooters prefer. And "the false shoulder is the superior method since it won't allow the case to move forward during the firing pin strike while the long seated bullet is no guarantee." --Don in Redondo, Benchrest.com.